I was a bit surprised when a couple of students on my recent Civil War trip attempted to purchase Confederate flags at one of the gift shops. Without giving it much thought I intercepted the students at the checkout counter and gently reminded them to think about the history that we had already examined as well as the talk on the history of the Confederate flag that I presented to the entire school. These students were not mean-spirited and perhaps it was just a case of boys being boys, but I did want them to do a little reflection before making the purchase. Neither student made the purchase, but if it had been made I would have insisted that the flags be kept out of sight. I stand by this decision. I’ve said before that I wish gift shops were a bit more selective about the kinds of souvenirs they sell. It trivializes the history and the very ground, where so many Americans gave their lives. There are any number of things to be upset about in connection to this news story out of Chapel Hill, North Carolina. Apparently, a couple of students at East Chapel Hill H.S. 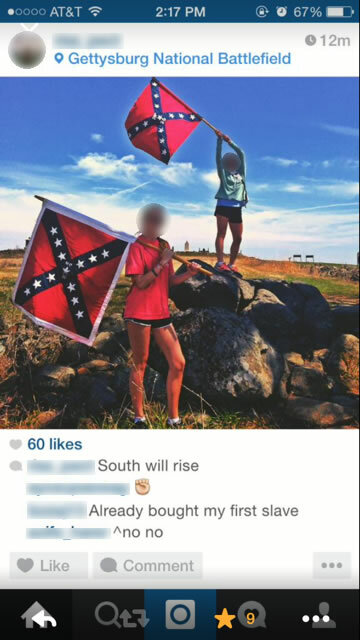 decided to post a pic of themselves on social media waving Confederate flags on the Gettysburg battlefield as part of a recent school trip. You can see for yourself what the students posted beneath the image. Needless to say, it’s pretty sad and constitutes nothing less than a major failure for the educators whose job it was to… you know … educate these students. While the racist language is troubling, I am more disturbed by the waving of the flag and lack of respect for the battlefield. This is not how you tour Gettysburg. In a letter to staff, the school district superintendent also urged instructors look at how “an understanding of race and discrimination, and their still-existing impact, is integrated into our curriculum and not taught as isolated topics.” “We must be sure our students understand how race impacts our lives, and how that impact can, and should be, both significant and positive. The future of our community, state and nation depends on it,” wrote Superintendent Thomas Forcella. I applaud the superintendent for his response, but let me suggest that next time this discussion should take place on the Gettysburg battlefield. True story (a bit long): My in-laws had a small arts & crafts business, and they would go to various shows and fairs throughout the southeast, selling puppets and stuff my father-in-law made out of wood. It earned enough money to pay for my future wife’s college tuition in the 1980s. They made a lot of friends within this world, and did a lot of favors for other exhibitors. Fast-forward to my early married years. Knowing of my Civil War interest, they contacted a guy they knew who melted down aluminum cans (soda and beer) to make sculptures. They asked him to do a Civil War soldier for their new son-in-law. Well, my in-laws live in Georgia, the sculptor guy lives in the Southeast, so he made the reasonable assumption that a Confederate soldier was what was wanted. So I now own this 2 foot tall Johnny Reb carrying a CBF. While I was not thrilled, I was in a poor position to object, so I said nothing. While we lived in Alabama it wasn’t an issue. But a few years after we moved up to Michigan, one of my son’s lady friends (not a “girl friend,” just a friend who happened to be female) was visiting and, I learned later, was visibly disturbed to see this thing on top of our entertainment center. I have wanted to explain this story to the young lady ever since, but have not had the chance. However, the statue has been moved to my basement office. That’s a great story, but I don’t see how we can move on without a photograph. OK, I took a picture, and uploaded it to my laptop, but the blog interface doesn’t want to let me include it. I’ll send it to you as an email. Try living in a state where the Confederate battle flag is incorporated into the state banner. I never understood this Confederate flag thing, particularly up North. Just curious where the incident about the purchase of the battle flag occured. Exactly what kind of items do you think a gift shop at a Civil War site should sell? Not sure and I can’t tell from the photo.